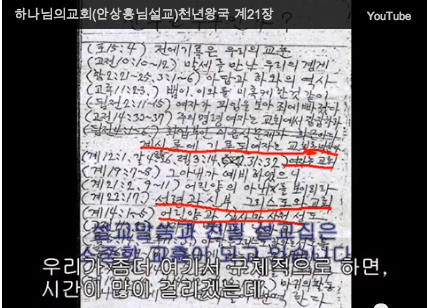 (갈 4장 22-26절) “기록된바 아브라함이 두 아들이 있으니 하나는 계집 종에게서 하나는 자유하는 여자에게서 났다 하였으나 계집 종에 게서는 육체를 따라 났고 자유하는 여자에게서는 약속으로 말미암았느 니라 이것은 비유니 이 여자들은 두 언약이라 하나는 시내산으로부터 종을 낳은 자니 곧 하갈이라 이 하갈은 아라비아에 있는 시내산으로 지금 있는 예루살렘과 같은데니 저가 그 여자들로 더불어 종노릇 하고 오직 위에 있는 예루살렘은 자유자니 곧 우리 어머니” 라한 이 말씀을 가지고 엄수인은 하늘에서 내려온 어머니라고 주장하고 있다. 엄수인은 생각하기를 하갈이 실지로 지상의 예루살렘이 되고 사라가 실지로 하늘 예루살렘이 된줄로 생각한다. 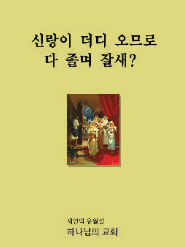 사도 바울이 갈라디아 4장 22-26절을 쓰게 된 것은 아브라함의 가정의 역사가 예언이 되는 것을 해명해 주신 것 뿐이다. (Galatians 4:22-26) “For it is written that Abraham had two sons, one by the slave woman and the other by the free woman. His son by the slave woman was born according to the flesh, but his son by the free woman was born as the result of a divine promise. These things are being taken figuratively: The women represent two covenants. One covenant is from Mount Sinai and bears children who are to be slaves: This is Hagar. Now Hagar stands for Mount Sinai in Arabia and corresponds to the present city of Jerusalem, because she is in slavery with her children. But the Jerusalem that is above if free, and she is our mother.” UhmSooIn thinks that Hagar is the actual earthly Jerusalem and Sarah as the actual heavenly Jerusalem. Apostle Paul writes Galatians 4:22-26 to explain the prophecy of Abraham’s family history. 엄수인은 그리스도의 어머니도 되고 그리스도의 신부 (아내) 도 된 셈 이다. UhmSooIn became the mother of Christ as well as the bride (wife) of Christ. Christ married his own mother???????!!!!!!!!! only the devil will do that. oh yeah WMSCOG how filthy you are.